I don't read a lot of non fiction books, to be honest, but recently I've been terribly fascinated by the adaptability of animals, and how their bodies are so perfectly suited to their lifestyles, or how their lifestyles are so uniquely adapted to their strange bodies. This book has a lot of great tidbits. Did you know there's a fish that grows at a rate equivalent to a human baby becoming an adult six times the size of the Titanic? Did you know that elephants may be able to communicate with other elephants 20 miles away by stomping on the ground? Why Pandas Do Handstands: And Other Curious Truths About Animals will give you hundreds of fascinating tidbits like this. The writing style gets a bit repetitive, as do some of the facts, but overall it's a fascinating look into the adaptability of animals. 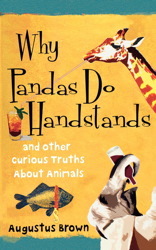 Click here to buy Why Pandas Do Handstands, by Augustus Brown. I'd never read anything by Alice Munro, though she's quite the famous author. This is one of her collections of short stories, and when my friend Marla lent it to me, she described the first story as "disturbing." The whole book is indeed rather dark and somewhat dreary, with long slow descriptions that are beautifully written but not always terribly engaging. Some of the details and ideas are quite interesting, and I love the Canadian settings. My main issue is with the endings. They are all very anti-climactic. Not just literary anti-climactic, where not everything gets prettily resolved and not everyone lives happily ever after, but truly anticlimactic--no bang at the end, as if there should have been more but she just got tired and quit. Maybe this is to reflect real life and the way true stories don't all tie up in nice bows at the end, and we don't always learn things or grow or even find nice little poetic twists to our own personal tales. Unfortunately, I want an END, so it's disappointing not to get one. Still, I think Alice Munro is a good writer, and I would read more of her work someday. Click to learn more about Alice Munro.